A few days ago we all went to Herne Bay for an evening by the seaside. 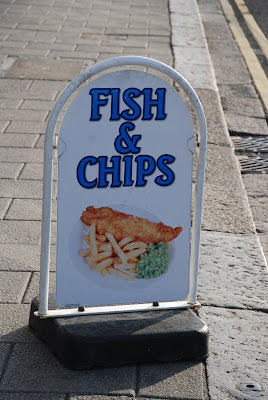 We walked along the sea for a little, then went for some greasy (very) fish and chips and after we played on the slot machines near by. Rose, are you fishing for a compliment? Well, you got it! Now here's something that goes with 'tartare' that I can eat. I hope lady luck prevailed at the slots, too. I have been considering to just hand my box of coins to the owner of the amusement arcade. That would be more enviromentally friendly because I would be saving all the electricity that I use leave the money behind anyway! Cool photo! I still can't get over for you "chips" means "french fries" and to me, chips means Fritos, Doritos, Pringles, etc., or the old 70s TV show CHiPs, with Ponch and Jon. Katie...did you say Ponch and Jon? Wow, I haven't thought of CHiPs in years. Television was a lot different then, wasn't it? someday I will eat fish and chips in England...with a pint. Two words, Rose: Vegas, baby!!! Don't ask me what that means, just sounded fun. How about a photo of yummy trifle?